Thank you for sailing with us on board 70000TONS OF METAL 2016, Round 6 of The Original, The World’s Biggest Heavy Metal Cruise! We hope you had a great time and enjoyed your stay on board. Your opinions, and ideas are very important to us. 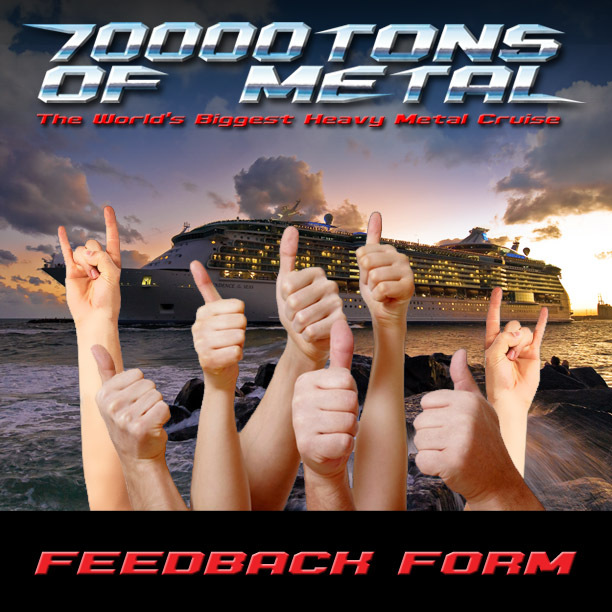 Your feedback will help us to make 70000TONS OF METAL even better in the future. Please be patient as it may take up to 24 hours for the system to send all Access Codes. If you do not receive yours within the next 24 hours, please make sure to check your spam folder and contact us. This survey will remain open up and until February 26, 2016 at 3PM Pacific Time (6PM Eastern Time). ← Thank You To All Survivors From 72 Nations!